Avi Grabinsky (@avigrabinsky) is working to make sports coaching easier for both coaches and athletes. Read our profile of him and his Health Graph (@healthgraphapi) integrated application, Coachya (@coachya), for more on how he’s doing it. 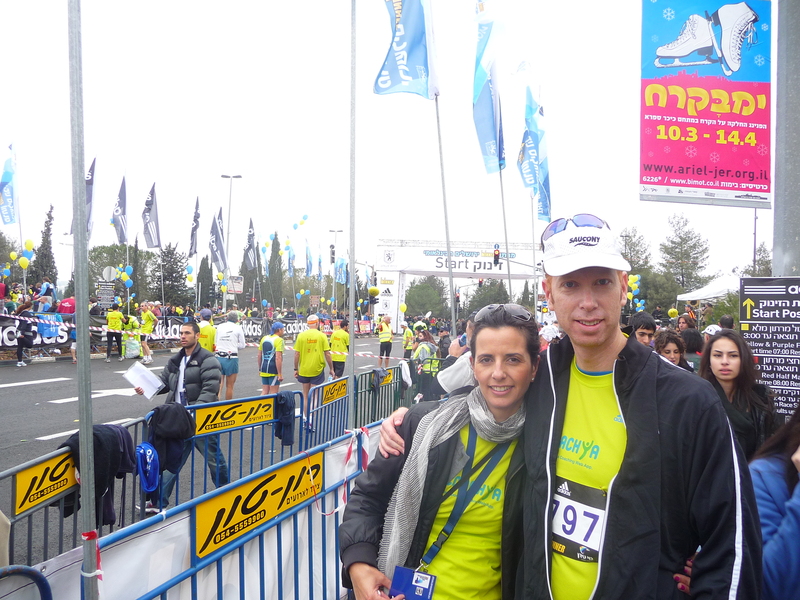 Avi Grabinsky: My wife and I (pictured together below) founded Coachya as a bootstrap start-up. We came across the idea of creating a web platform for coaches after training for several triathlon teams. It seemed odd that many coaches use spreadsheets to handout workout plans, email for feedback from athletes, and checks for billing. So we defined a solution to cover all that in a simple and friendly platform. Both of us are engineers (I’m an Electrical engineer and my wife is an Information Systems engineer). We greatly enjoy working on the site and watching our customers use it. I am mostly involved on the product aspects, while Michal, my wife, handles the marketing side. BD: What is the “elevator pitch” for why someone should use Coachya? Coaches use Coachya to easily coach, manage, and bill their sports teams and athletes online. Coachya puts multiple online activities which coaches use under “one roof” in an extremely easy to use web application. Athletes can train with a team, a coach, or by themselves on Coachya and plan their future workouts, watch their stats, share workouts with teammates, and more. AG: I’d heard about RunKeeper from friends, used it a couple of times, and come across the Health Graph API through blog posts. It struck me that it would be a great idea to me to connect Coachya to the Health Graph as it’s a win-win for both of us. 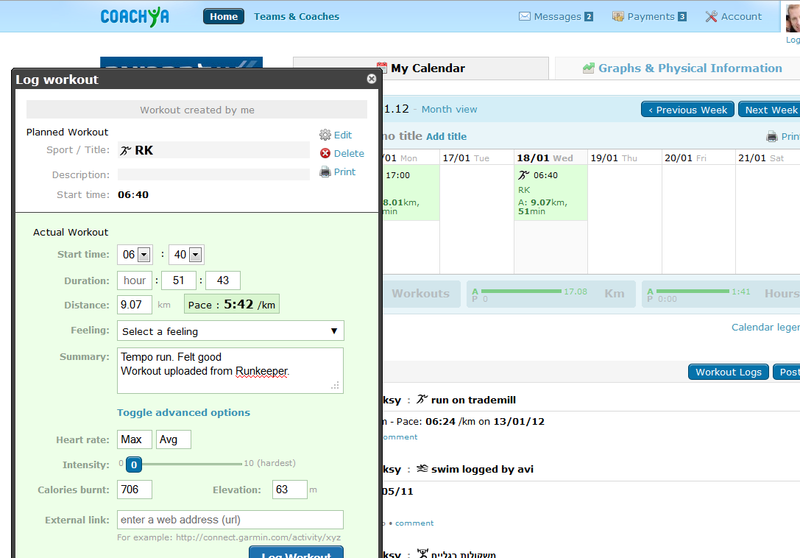 AG: The Health Graph API saves Coachya’s athletes the time of manually entering their workouts into the system. It also provides instantaneous feedback to the coach on his/her athlete’s workout. AG: Coachya currently reads in workout data (mostly totals) and presents it to the athlete and his/her coach. AG: Once I understood how to work with the API, it was very easy to query new node types. I think the API is very “clean” and nicely structured. It seems to work really well. That said there are a few things I think could improve it even more. I’d like to see more examples provided in the major scripting languages (PHP, Ruby, .NET). It would also help if the FitnessFeed contained additional singular parameters such as Note and Climb. Not having those parameters forces me to fetch “Past Parameters” which is quite huge. AG: Apart from the above, it might also be nice if there was some a push mode instead of the pull mode that is currently available. BD: Can you share any future plans for Coachya? What’s coming next that your users will be excited about? Does the Health Graph play a role in that, and if so, how? AG: Coachya’s main value is its ease of use for both coaches and their athletes. We plan to make it even easier to use by adding functions such as the ability to search for library workouts, copy and paste workouts, and more. Additionally coaches will soon be able to publish and sell their workout plans to athletes and we intend to do it differently than what’s available today on other sites. Athletes will also have more graph types available to them to track and analyze their past workouts.